What is a pâtisserie you ask? For those who don’t know, it’s a French bakery that specializes in pastries and sweets. I don’t know if it’s my obsession with wanting to visit Paris, my planning a European vacation right now, or the fact that my best friend has been preparing for her family trip to Paris (and is there as I write this) but everything French is on my mind right now. 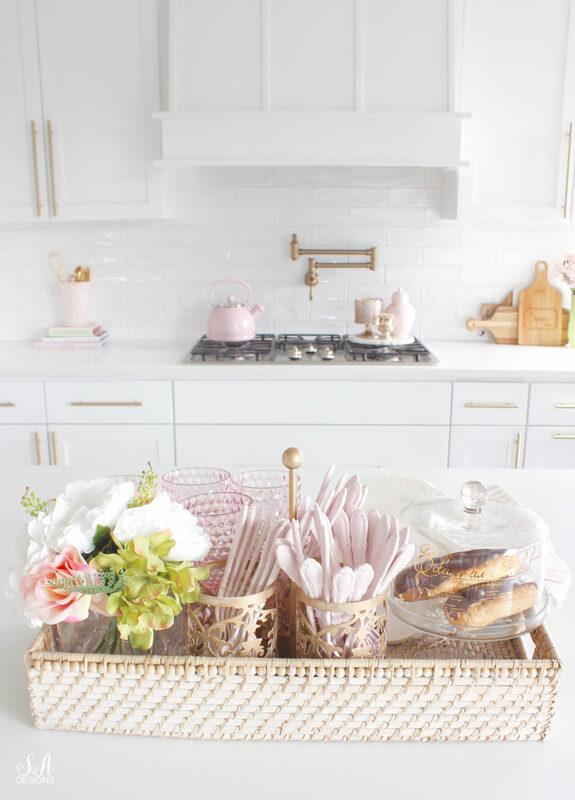 So when a few friends and I teamed up with HomeGoods to bring you 4 different Mothers’ Day Gift Basket Ideas, I started walking down the aisles of this favorite home store of mine and the idea came to me…with a little French twist. Here’s how to create a pâtisserie gift basket for Mom this Mothers’ Day. This post contains affiliate links for your shopping convenience. Click here to read my full disclosure policy and here for my privacy & cookies policy. All opinions are my own. Let me just preface this with saying that we were all given $100 in gift cards and the challenge to only use that amount to create this gift basket. 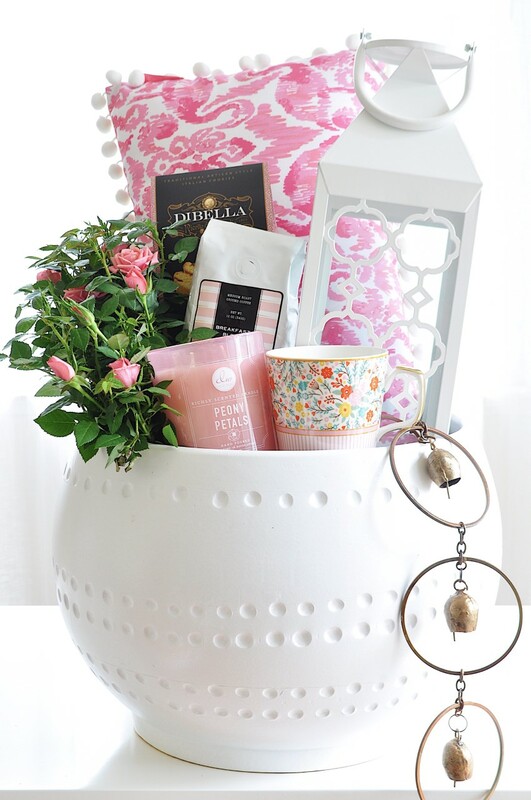 I had already come up with a relaxation gift basket last year for Mothers’ Day and then another idea that I had in my head didn’t work out exactly how I wanted it to. However, there were so many fun things and gift ideas so I knew it would come. 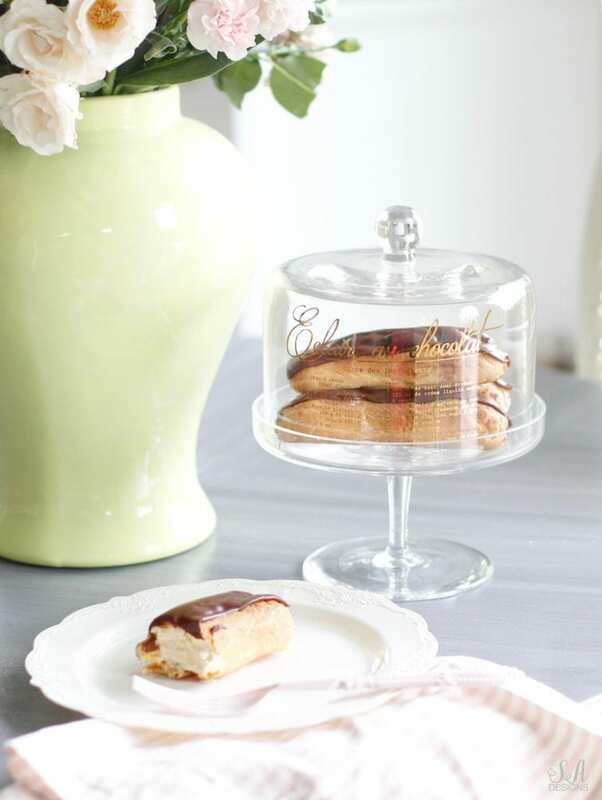 But then…I saw the cutest dessert stand that said “eclair au chocolat” with the recipe printed on it in gold script. Ding ding ding! Chocolate eclairs! What mom doesn’t love chocolate or dessert? And this is two in one! After finding that cute eclair stand, I knew what kinds of other things I wanted to put inside the basket but next I wanted to find the basket itself. I thought a tray would be best. Then I found this cute woven tray that had that “basket” feel to it and would hold everything. 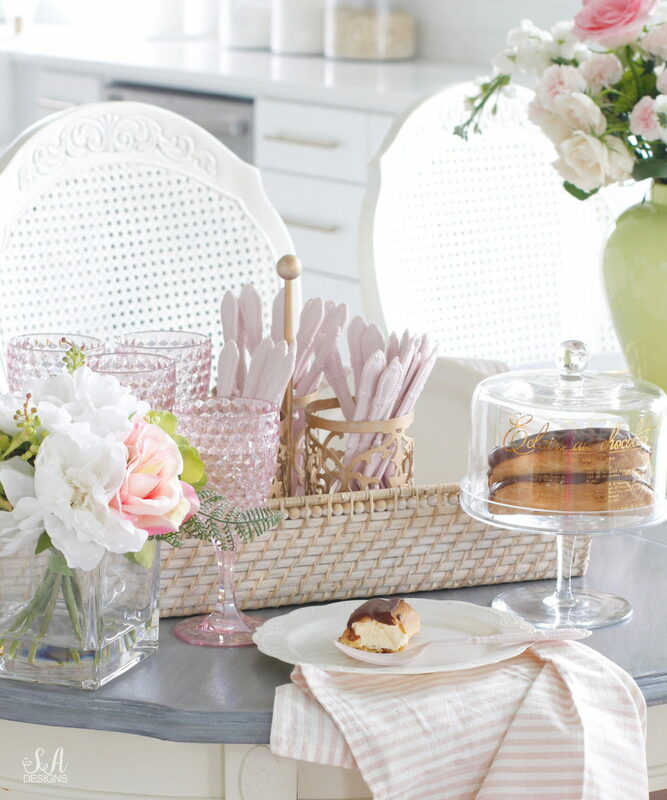 It would be like bringing a French Pâtisserie to Mom in a basket! 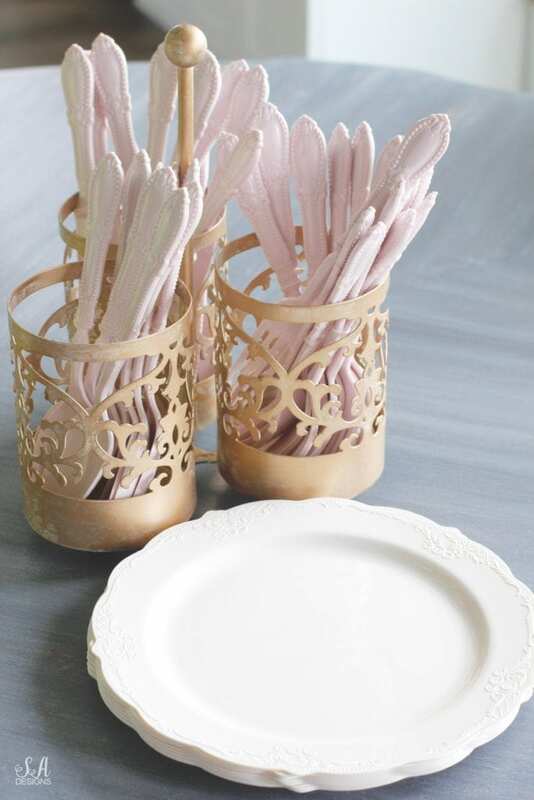 And the best part is, it also contains some really cute serveware, some of which are perfect for the outdoors this time of year. Both my mom and I love to entertain our girlfriends, especially outdoors in the spring and summer, and have people over so I just know she’d love this gift as much as I would! 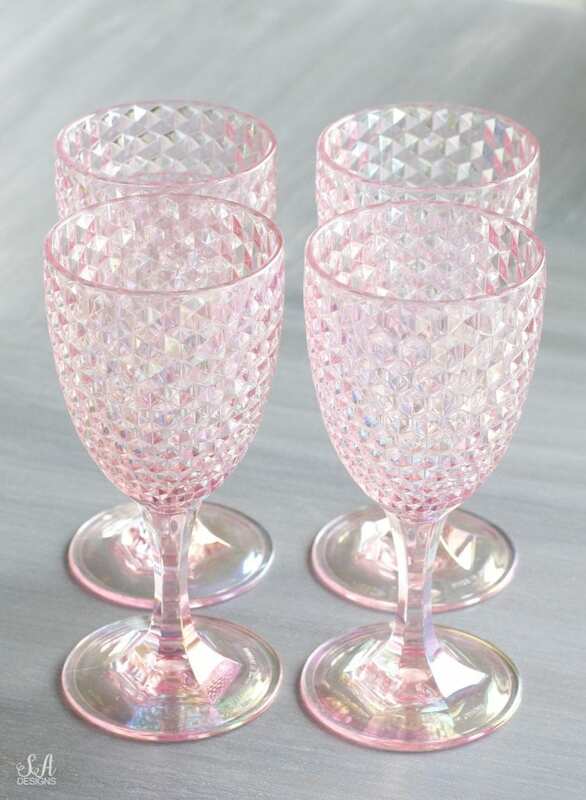 I saw these darling pink shimmery goblets in the outdoor dining aisle and went crazy over them. The French are fancy right?! Mom needs pretty goblets when she’s entertaining. Finding this gold caddy for the flatware was just awesome! I’ve always wanted one so I got one for me, too. I just adore these disposable vintage-style ivory plates and grabbed some of those. 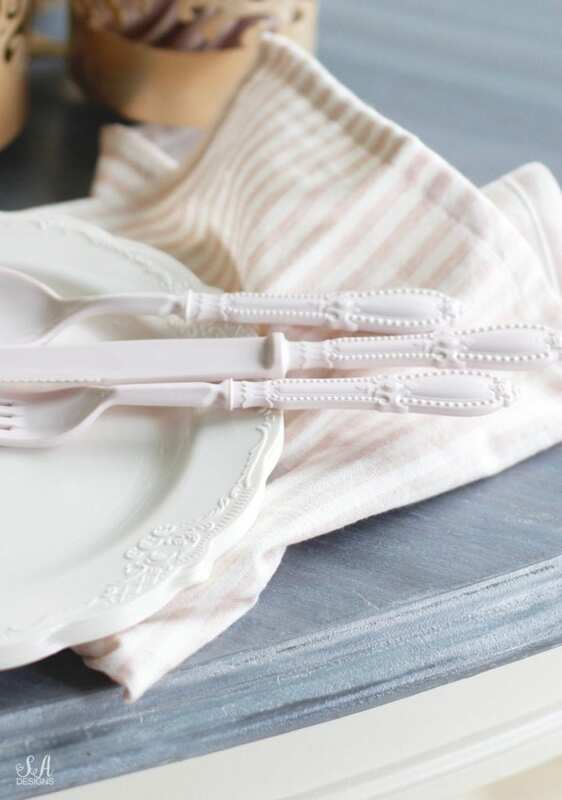 I found the cutest disposable vintage-style pink flatware and hadn’t seen those before. They were also perfect for this basket. 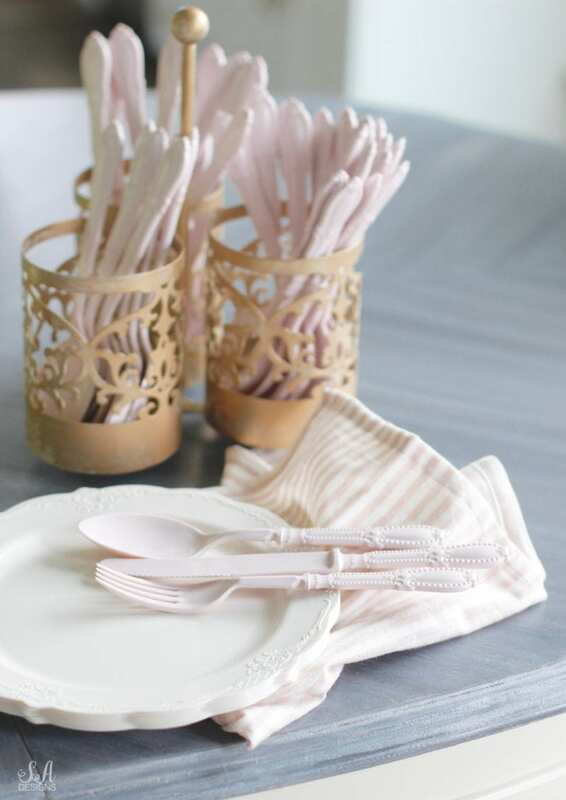 I needed napkins and when I found these light pink striped linen napkins….gold! I was so thrilled. 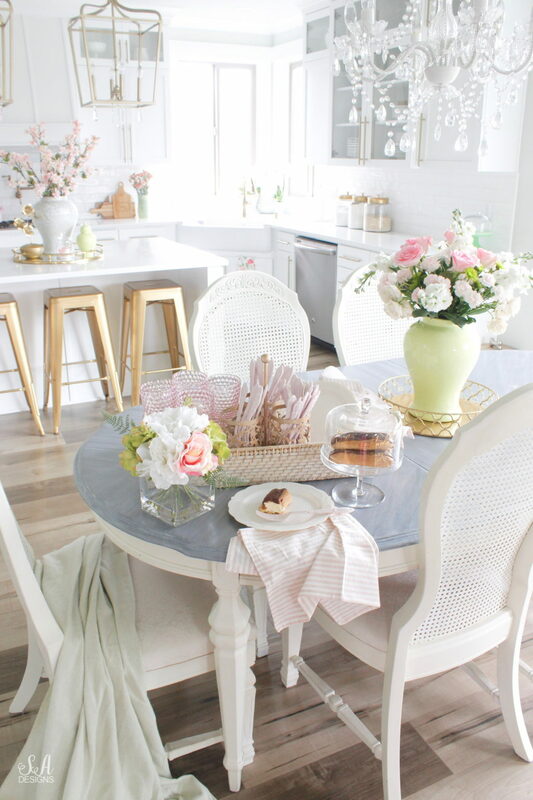 Of course, every Pâtisserie table needs some flowers so I grabbed a beautiful spring arrangement of faux flowers for my basket. I mean, if I could do it right now, taking Mom to Paris would be très magnifique for a Mothers’ Day gift. 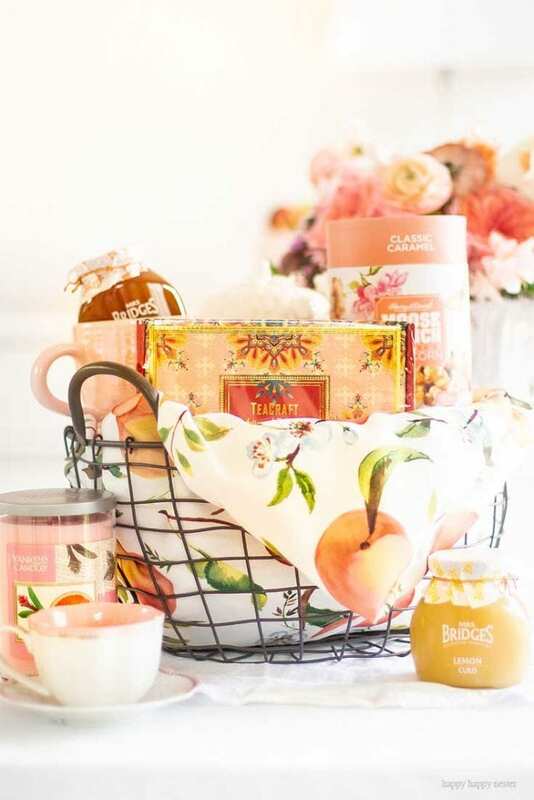 BUT I think that bringing her this darling pâtisserie gift basket for Mothers’ Day (with some chocolate eclairs too) would be such a treat and I just know she’d be delighted to get them. I know I’d absolutely adore such a unique idea. Of course, I have a list of French songs I love so I’d be playing that too, while enjoying eclairs with a few girlfriends. Please pin this to Pinterest and save the idea! 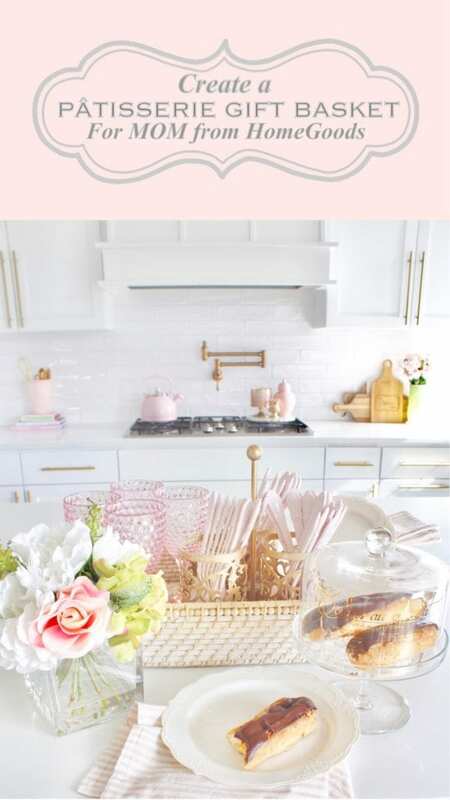 Please visit my 3 other friends joining me in sharing what they came up with in creating their Mothers’ Day Gift Baskets with items from HomeGoods! I’m so glad you could stop by today! I would love it if you could subscribe at the top of the page in order to receive my weekly emails of all my latest blog posts and see everything I’m working on! You can also follow me on Instagram, Pinterest, and Facebook to see what I’m up to in creating a home and lifestyle of inspiration! Want to shop my Instagram posts? 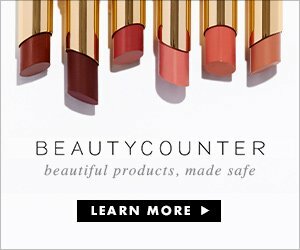 Click on any square below! Summer I love how you brought a bit of Paris flair to Mom! 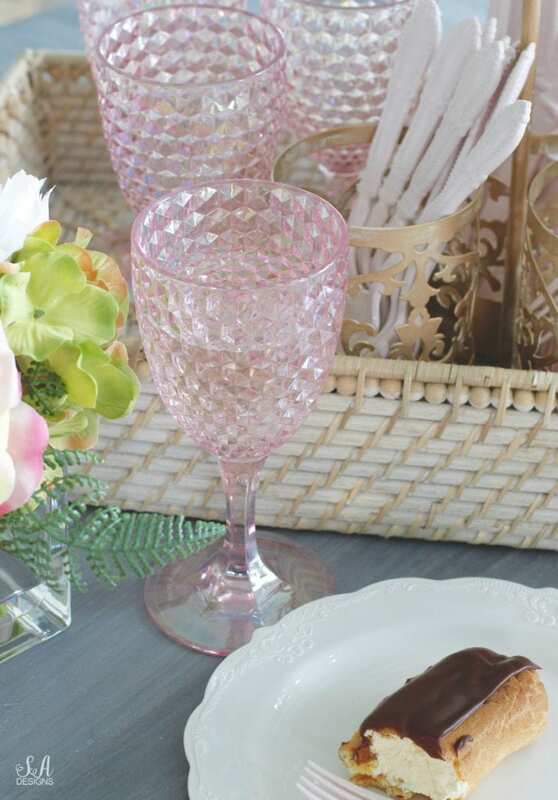 You know how I adore the pink glassware! But I must say I am going to search my HomeGoods for the darling eclair stand!